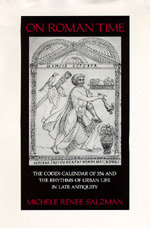 Because they list all the public holidays and pagan festivals of the age, calendars provide unique insights into the culture and everyday life of ancient Rome. The Codex-Calendar of 354 miraculously survived the Fall of Rome. Although it was subsequently lost, the copies made in the Renaissance remain invaluable documents of Roman society and religion in the years between Constantine's conversion and the fall of the Western Empire. In this richly illustrated book, Michele Renee Salzman establishes that the traditions of Roman art and literature were still very much alive in the mid-fourth century. Going beyond this analysis of precedents and genre, Salzman also studies the Calendar of 354 as a reflection of the world that produced and used it. Her work reveals the continuing importance of pagan festivals and cults in the Christian era and highlights the rise of a respectable aristocratic Christianity that combined pagan and Christian practices. Salzman stresses the key role of the Christian emperors and imperial institutions in supporting pagan rituals. Such policies of accomodation and assimilation resulted in a gradual and relatively peaceful transformation of Rome from a pagan to a Christian capital. Michele Renee Salzman is Associate Professor of History at University of California, Riverside.